The Multimedia Scale Converter converts composite video signals into computer video signals and broadcasts both audio and video from a composite source like a VCR or Camcorder to any standard computer monitor and speakers. Supports NTSC, PAL and SECAM broadcasting systems. The Multimedia Scale Converter can switch between a video source and a computer allowing the user to work freely without the use of connecting/disconnecting cables. The Multimedia Scale Converter (MSC) is a product that fits into both A/V and CBT applications. In the A/V market use the MSC to convert any composite video source into high-resolution computer video signals for broadcasting and display with any standard computer video extenders, splitters or broadcasters. This includes Minicom's new CAT5 VDT, CAT5 AV Splitter and CAT5 VDS. In the CBT market, where Minicom's Classnet systems are installed, the MSC turns your computerized classroom into a multimedia center. 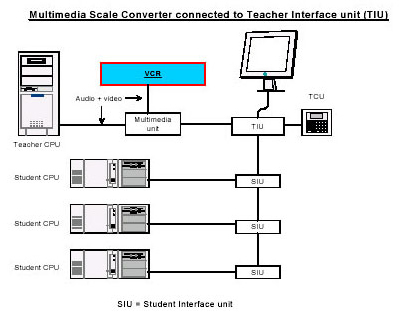 Connect the MSC to the Teacher Interface Unit (TIU) or any Student Interface Unit (SIU) of the Classnet system to broadcast video movies to all students. The MSC is compatible with ALL Classnet� models and with its unique switching feature teacher or student can work undisturbed while the MSC is not broadcasting audio or video signals. Unique switching feature between external composite video signal and local computer video signal. Supports PAL, NTSC and SECAM broadcasting systems. One Universal unit that is compatible with all Classnet models. Flexible location in the classroom - Can be connected to either the TIU or SIU. VGA and Audio cables included. 1 Power adapter + cord.